I'm finally getting some free time where I can get my pool open and oh what a mess it is. The mesh cover was full of leaves under the surface of the water. Got out all I could but I had to take the cover off myself since I was home alone. 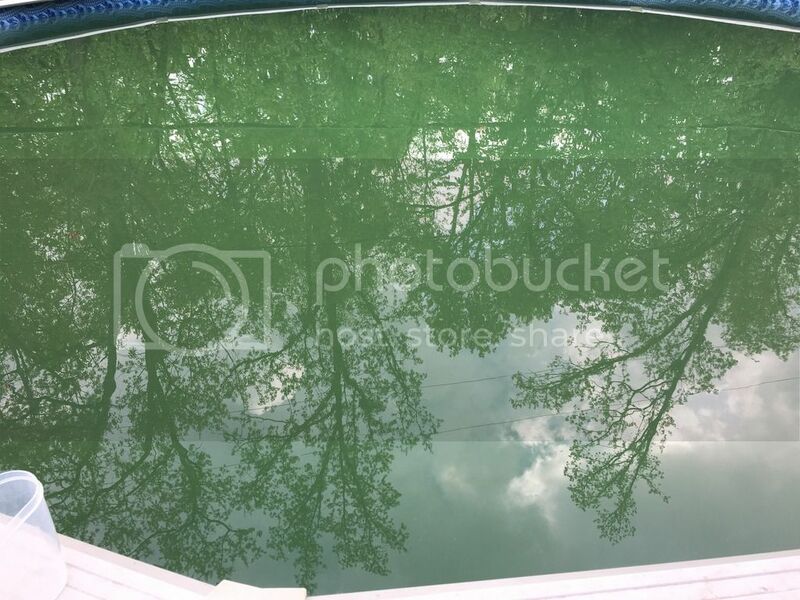 I'm getting leaves off the bottom of the pool but I can only see down maybe 10" because it's so green. It's slimy along the wall and smells like a lake. Looks like I'm gonna have my work cut out for me. I need to hook up my plumbing this evening and continue to get leaves off the bottom. Here's some pictures of it. Once you get your pump going. Post your numbers and we'll get that swamp clean again. Got all the plumbing hooked up and of course I have a few drips but I'm not going to worry to much about those right now. Skimmed a bunch of crud off the top, more leaves on the bottom and just fired up the pump. Looks like there is a bunch of what I assume is algae clumps all over the place. How sunny is it right now? I'd bring that up to about 10ppm FC and then run it for a while, then bring up the CyA to 40 ppm, increasing FC along with it. It's been sunny all day and 83 degrees out. I put enough bleach in to bring it up to 10ppm and I need to get more cya, only had enough to get up to about 20ppm. I've skimmed, raked, brushed the entire pool and I'm sure there are still some leaves at the bottom, just can't see them. Looks like rain the next 2 days and cloudy. 0 was the chlorine reading this morning, guess all the organics in the pool burned through 2 gallons over night. Dumped 2 more gallons in this morning. Don't forget that when you are SLaMMing you need to test and redose as often as possible. At least ever hour or so to start with. Once the chlorine starts to hold, then you can back off to ever few hours or so. I would not bring the CYA up any higher for right now. 20 CYA will help you not have to use as much chlorine. Make sure to take a pic a day so you can see your progress. @kimkats I'll leave the CYA as is for now then. Man I'm burning through the bleach, going to add more to get it back up to 10ppm. I can only check it at morning, lunch and evening....Is that ok? Took a couple of pics, I can see the color changing even after a few days. If you can add at lunch you are going to be one ahead of what I say for working folks like us. This works for most for working days. So do I need to check it that often? Better place order for more reagents tomorrow. Here's a picture from this evening before I skimmed, raked, brushed, skimmed and raked again. What I usually say is, test as often as you can. Every hour or so to start. Then as the chlorine starts hold, you stretch it to every few hours. The more you test and redose, the faster it will go. @pabeader I was just wondering because I won't be able to test that often other than what I mentioned above. You test as often as you can........life comes first! It will take a little longer but even testing 3 times is better than none. No problem. Just a rule of thumb. You do what you can, and we will be here with encouragement as needed. Checked it before bed and FC was 9.5ppm, added enough to get it up to 13ppm and this morning when I checked it was at 10ppm. It sure looks a lot better than it did but I still have a long way to go. I will check it again at lunch. I'll have to rake,skim and brush when I get home tonight. It's been raining all morning long, water level is up some. Checked FC at lunch, 9ppm, added more bleach to get me up to 11ppm. I know I'm supposed to be at 10ppm for my shock level but I just like to go a tad bit higher. 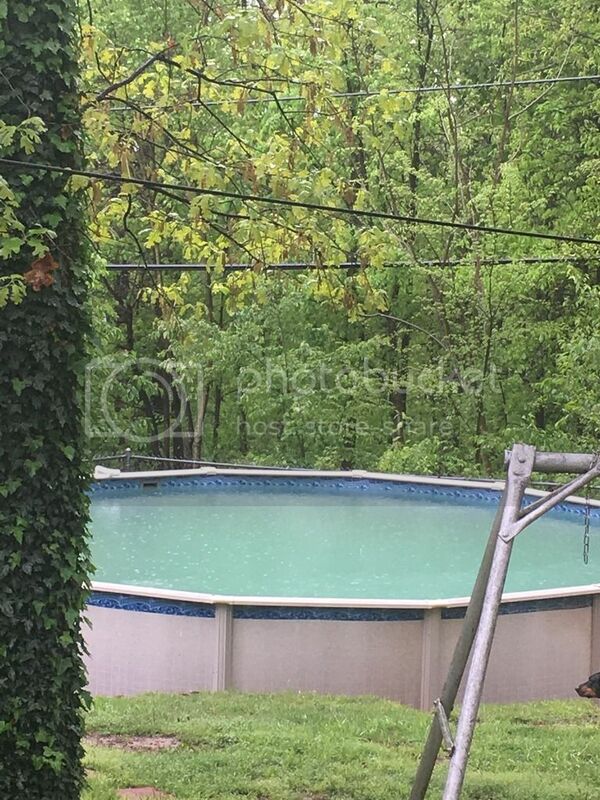 Here's a picture my daughter took of how the pool looked (she didn't want to go out in the rain). SWEET! You are trending towards blue now!!! Keep it up!